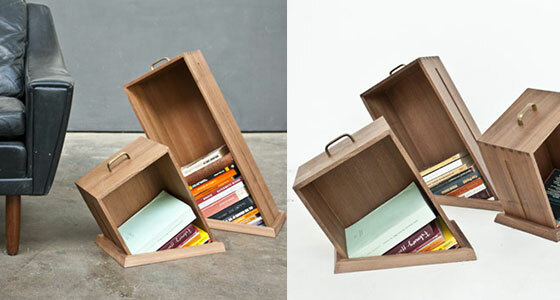 If you need something to store your books, why not choose something that makes a statement. 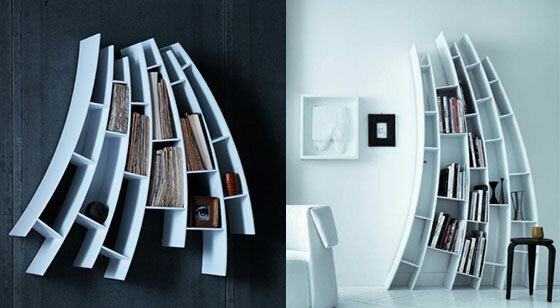 Take a look at this bookcases collection, which offers you endless options for storage and display in your home. With many different styles, materials, sizes, and finishes available, there is sure to be an option that will fit your needs. 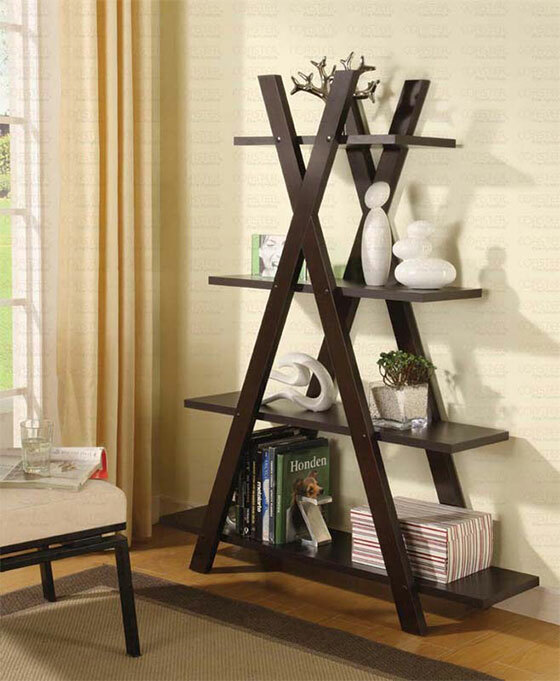 Store books, and show off decorative items in your hallway, home office, living room, or other space. 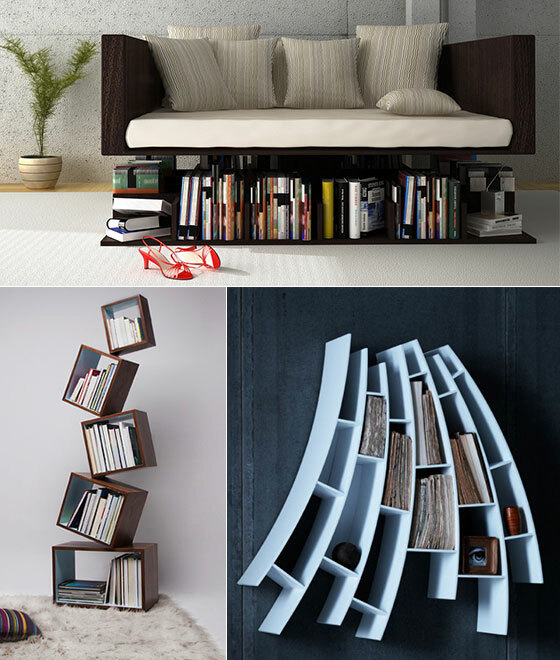 So, if you or a book-lover you know are stuck on how to redecorate your urban dwelling and store your favorite volumes, here are 12 Playful and Unusual Bookcases which will spice up your home, adding a personal touch to your space. 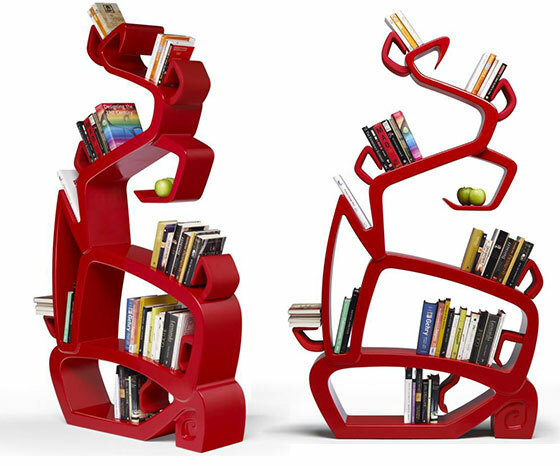 REK is a bookcase that grows with your book collection. The more books the bigger the bookcase gets. The zigzag shaped parts slide in and out to accomodate books in the resulting voids. REK will always be full, regardless of the quantity of books. Also the books can be arranged according to their sizes. The narrow spaces are excellent for magazines. MYDNA is a smart and elegant remake of the simple shelf typology but with a twist. MYDNA is a chic and contemporary storage system inspired by the DNA concept in two different ways, fist its sophisticated, organic and stylish structure in the shape of double helix and second with a metaphorical statement which establish that everything you place on its shelves define a significant part of your personal identity. 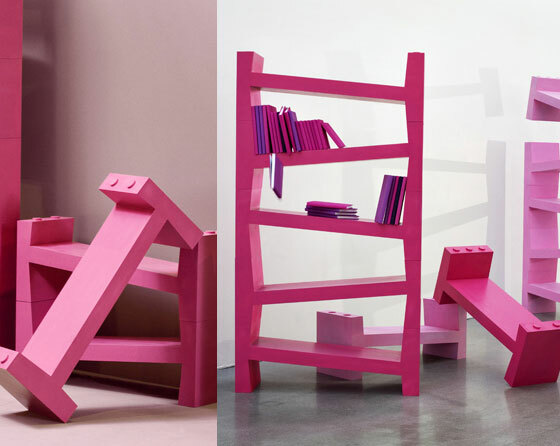 Creative “Hole In The Floor” bookcase by design studio Raw Edges appears to be slowly sinking into a hole. It was made to look like the drawer of a cabinet. 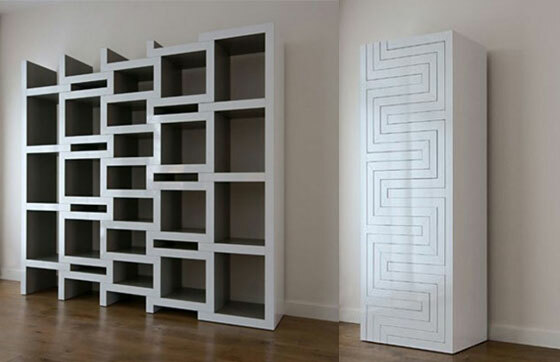 These creative bookcases have a classic handle and telltale grooves carved into its side. The Hole In The Floor bookcase is playful and unusual and can add a special touch to the modern or traditional living room or almost any other room in the house. 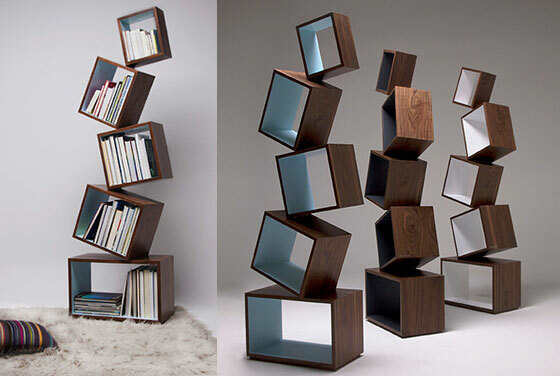 Created by designers from Colombia-based studio Malagana Design, it is called Equilibrium Bookcase. All modules are stacked upon each other at a single angled point. 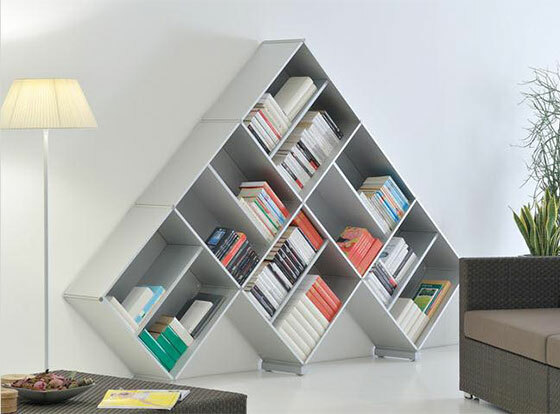 Despite it looks like floating in the air, Equilibrium Bookcase can hold over 120 Lbs of weight. Such furniture will surely make your interior surprising. 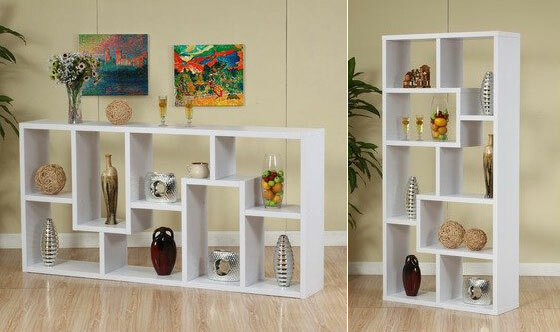 -Features unique different leveled contour shelves. -Display cabinet can be placed horizontality or vertically. -Boosted of a hard sturdy frame. Construction: -Constructed of MDF and strength enhancing veneers. Color/Finish: -Pure white finish.-Fully finished on all sides, display cabinet makes a striking and functional room divider. The Skew Bookcase consists of identical modular components that are stacked facing alternate directions to create sloping shelves. To assemble it you just rotate the parts and place them on top of each other. Sloping shelves mean you do not have to arrange the shelves in various heights as with ordinary bookcases. There is room for binders at the high end of each shelve and pocket books at the low end. Fitting provides modular storage solutions for the modern home. Appearing weightless in white, this is definitely a dominant piece for your home. Its exclusive ‘linking system’ enables an infinite variety of assembly solutions thus making it ideal for offices, retail and homes. This light, stunning bookcase is arched rather like a waxing moon. Functional and at the same time creating a strong decorative effect, it consists of slanting internal shelves and dividers that create a curved line, with a decidedly harmonious effect. Material: opaque white lacquered wood. If requested it is available in all RAL colours. Inspired by the unexpected shapes of blooming nature, your personal Wisdom Tree can hold about a hundred books in its branches. It features seven leather-covered supports, and the main structure is made of wood and lacquered in acetate. You can choose from three different colours: red, white and black. Wisdom Tree can be placed both against a wall or standing alone in the middle of a room, delimiting two different spaces. 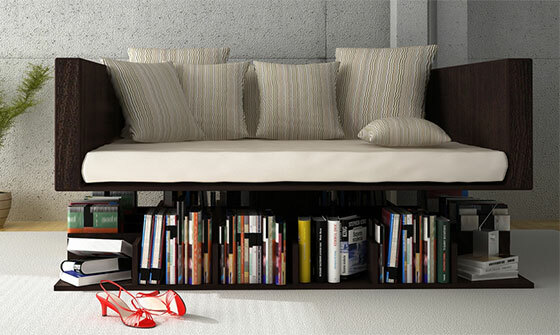 Rolling bookcase is really unusual furniture and luxurious stay cool modern look. despite the unusual shape and round dross but it can adjust the design idea of space you want with bright colors. Made of polypropylene extended in various colors, each containing cells that you put in. 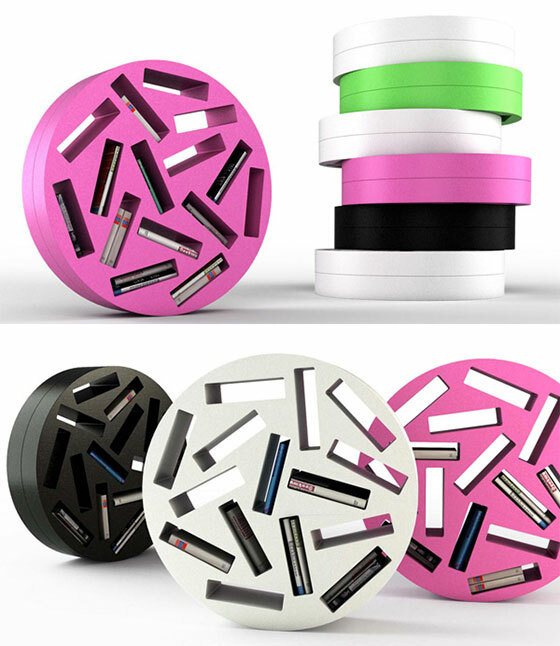 You will have to be very selective in your choices as you can only use this piece to store 15 books. His Ransa sofa is a gorgeous contemporary piece, a sofa sculpturally placed on top of a bookcase pedestal, ideal for having one’s favorite books at their fingertips. This furniture item is minimal in shape, refined in colors and the wooden finish, sophisticated through the seemingly suspended structure. Wow they all are absolutely incredible. 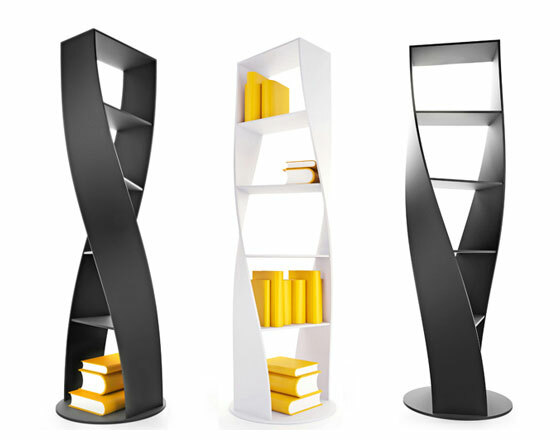 I especially love the Equilibrium Bookcase, it looks so amazing, very stylish. Thanks a lot for sharing this.